My book has a due date! Some people have asked what it’s like to write a book. Well, it’s kind of like having a baby. Twice. And I’m not just saying that because it’s a book about motherhood. Let me tell you a little about birth #1. I had a nagging feeling for a couple of years that this was a book I was supposed to write. I had pitched the idea with an editor in May 2011 and received a little bit of encouragement, but I just could not figure out when a mother of young children was supposed to write. At the beginning of 2012, when that feeling became more intense and a little more urgent, I knew I needed to figure it out. Matt was key because he helped me make a schedule and took over all childcare (in his own dad-kind of way, I might add) for those few hours a week we blocked out. And I began to write. I wrote an email, attached the manuscript, and pushed the Gmail send button on Friday, April 27th, 2012, at 11:59 p.m. I honestly felt like I had given birth. I felt this huge rush of relief that it was over. I felt proud, and happy, and scared, and absolutely exhausted. I was physically tired and mentally spent. I had no idea if anything would ever come of that experience, but I did feel really proud that I had set a goal, worked hard, and finished it. Or so I thought. I hadn’t finished yet. Enter gestation period #2. On August 13, 2012, I got the news that the book would be published (!!!) in March 2013. Seven months, and there was a lot of work still to do. Preparing the book for publication was much more time-consuming than I had anticipated. At one point my editor told me that people don’t usually write more than one non-fiction book once they realize how much work it is to get it ready. Anyway, months were spent on source checking and copyright clearance and editing and reorganizing and tweaking. Some weeks were very intense and some weeks went by where everything was in the editor’s hands and I would just await my next assignment. In November, the final edits were complete, and I got to see the first proofs of the book in January. After a few last-minute tweaks, my editor and I handed it over to the printers–my little almost-book. I’m happy to announce that the book has a real due date now. Seagull Book, 218 NW. State Road (next to Hobby Lobby), American Fork, UT. Here is the event page on Facebook with more details, and you can RSVP there as well (optional). Like any expectant parent, I have so many mixed emotions. Am I excited? Yes, but I’m also terrified. The whole thing feels a little bit like running for student council in junior high. I hope they like me. It feels vulnerable. It was such a thrill to find out it was going to be published, but that feeling was immediately followed by a flash of terror: What if it’s a total flop? What if people read it and judge me as a mother? (They will.) What if it makes me sound like an expert on motherhood when I’m really just figuring it out like every one else? And failing often, I might add. I have spent most of my life with the gift of confidence. Honestly, other than becoming a mother and feeling totally inadequate in that job, I have usually been quite self-assured. But publishing a book and having other experiences and opportunities appear that all seem so much bigger than me? I know it seems like it should build confidence, but it mostly makes me feel insecure. Seriously, I am a forty year old woman, and I’m having an adolescent crisis. 🙂 But I also feel blessed, and in moments where I don’t panic or worry about it, I think to myself, Stephanie, even if the book only sells ten copies, but those ten copies help ten women to gain a greater testimony of the power and importance of their role as mothers, then you have succeeded. And then I breathe deeper and relax and try not to think about it. I keep trying to surrender it all to God and hope for the best. So all this rambling is basically an early birth announcement: Behold, my book is born. If anyone out there dares to read it, I really hope you like it. The book is available for pre-order at Deseret Book’s website, and you can read a quick summary there as well. 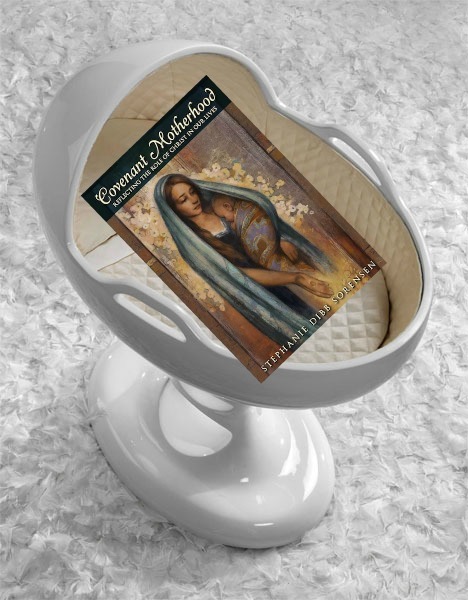 And finally, if you have a Goodreads account and want to add Covenant Motherhood to your To-Read list, you can do that here. There you have it. Welcome to the world, little book.